Before I go any further, I have to point out that while I believe that I'm right about the material in this article, I'm by no means a 40k god and there are definitely dissenting opinions regarding the topic of Duality. For great examples, I'd suggest reading this article on the B&C Forums. While a person could talk about the term of duality and its relation to 40k armies for hours on end, I'll try to keep my arguments clean and concise. Duality is an important word to know and understand, but I want everyone to throw their dictionaries out the window here. There are many words (such as versatility and adaptability) that can be used to describe the philosophy that is "duality". Getting nit-picky about which is the better term for the idea is a bunch of crap. So to clarify right away, my definition for duality is 'a unit that can perform multiple roles on the battlefield'. This may be as narrow as anti-tank and anti-infantry, but may also be as broad as objective taking, mobile terrain, playing a distraction role, etc. It does NOT have to reference only AT and AI. Fighting over what term to use (when it all essentially means the same thing) is only wasting the time of people who are trying to learn the concept. For ease of discussion, duality will be used as it's the most readily known term in the community. Now that the formalities are out of the way, let's continue on. Duality is extremely important. It is what gives our army the ability to take on any number of different opponents and have a reasonable chance at coming up on top with a win. If you take an army that has lots of anti-infantry fire, but lacks the means to destroy multi-wound models like vehicles, you'll have a rough time winning against mechanized armies because you're unable to use that AI fire on your enemy until you get them out of their transports! The opposite is true on the other extreme; if you have so much anti-tank fire that you've no problem destroying vehicles but lack the means to deal with infantry effectively, you're going to lose. You need to have both options in decent numbers to compete, otherwise you are just relying on luck to give you a favorable matchup. What about specializing units in your army and using them in concert with each other to provide duality? This is workable, but not really effective over a long game. Any number of things can go wrong in a battle that could isolate or marginalize the effectiveness of a specialized unit. A mechanized army that destroys an AT unit supporting a specialized CC unit (that can't kill armor) essentially destroyed both units without actually doing it! The same can be said of the polar opposite. The randomness of the 40k game just does not allow you to specialize your units and maintain duality effectively. Of course, this only refers to the AT and AI part of duality. 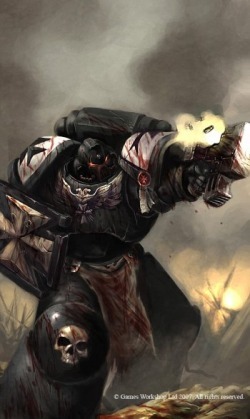 With that being said, the changes in 8th Edition ensure that the most ineffective weapon can still rarely do damage to high toughness units, so keep that in mind. Obviously, rock armies tend not to include much duality, as they are very one-dimensional and depend on the right matchups to win their battles. So what do you do then? You select units in your army that can fulfill multiple roles on the battlefield. A beginning point is to give each unit the ability to function as AT and AI if needed. An example is the Black Templars Crusader squad. They can be armed in any number of ways, but most players choose to arm them with power weapons and plasmaguns. What this does is give the unit the ability to destroy multi-wound models over time, even if it's going to take a couple turns. The unit itself is good at killing infantry with the power weapon attacks, plus the weight of your other close combat attacks. You can also increase your multi-wound model killing potential by changing the power weapon to a power fist/thunder hammer, but you incur significant point increases to do so. Which isn't necessarily a bad thing, so long as your list has the points to spare. Another "popular" unit setup is to give Crusader squads a Flamer and Power Weapons. But why would someone do this? Sure you're going to kill lots of infantry, if there happen to be any around on the ground. But what if there isn't any? How are you going to kill vehicles to get to said infantry with that setup? Or what happens if a dreadnought or wraithlord assaults the squad? You've set up your unit to fail from the start. I hope you enjoy that wasted 200+ points. It is always wise to include units in your lists that can deal with infantry, vehicles, or other high wound creatures if it is forced to. They don't have to be great at it, just good enough to where you can delegate them to the role if it's required of them. Even if the unit cannot kill things, that doesn't mean that a unit won't fulfill its role in duality. An example is the Rhino. What does it do? They transport your troops across the board, closer to objectives, enemy units, or anything else. But what happens after that? An empty Rhino is still a valuable resource to your mission plan. It provides mobile cover that can block LOS, it can assault units, or block your enemy's advance on your position. Duality! Or we have the Land Speeder Typhoon. Yes it fulfills AT and AI roles with its Heavy Bolter and Typhoon Missile Launcher. But what about giving skimmer based cover to your units, movement blocking, or contesting objectives late in the game? It's an unit that can fulfill a great many roles on the battlefield. Now that you have an idea of what to look for in a unit, what are examples of units that don't provide very good duality? The example I use most frequently is the Predator Annihilator. It is especially good at destroying high wound models, but is terrible at killing infantry. Sure you can use it to block enemy advancements, assault, or block LOS...but that would often require you to move, which inhibits its ability to fire accurately! To use them effectively, they need to sit in open lanes of fire and not move. How does that provide duality to your army? Oh, wait. It doesn't. Occasionally an unit will not fulfill duality by themselves in a certain setup. But that's sometimes okay, as with properly armed transports, you can gain it by using a list building tool that Stelek calls "1+1". This means that your infantry unit is devoted towards on role in the battle and their transport deals with the other. For example, a small Dark Eldar Warrior Squad is armed with a blaster and has a Blast Pistol-armed Sybarite leading them. This unit is good at shooting vehicles, but only marginally good at shooting infantry. So what do you do? You put that unit in a Venom with dual Splinter Cannons. That way the transport can cover your unit's deficiency against infantry. Its that simple. Fortunately, most Space Marine units are able to build duality into their units without needing to use this, but its important to understand nonetheless. To reiterate: Just because a unit has the ability to deal with multiple threats doesn't mean it's terrible at any one of them. Jack-of-all-trades doesn't have to be a bad thing! I'm not sure about you, but I'd rather have a versatile and balanced army with units that fulfill duality over the alternative. You'll find yourself in a much better position to win games, as you're more apt to deal with the changing flow of battle. The loss of a particular AT unit might cripple an army that doesn't follow duality, while barely even phasing one that does follow its merits. I strongly suggest you look into taking duality into account when you are building your lists. Even the most specialized units such as Assault Terminators have the ability to deal with both high wound models and infantry simply by taking a combination of Lightning Claws and Thunder Hammers, so don't cut down your chances to win! Food for thought, and delicious food it is. This section is going to be used to show new players different setups for some of our units that creates duality for our armies. This obviously is not an all-inclusive list. Unfortunately, some of them are dependent on our army's archetype and that will be noted in each entry. There will be three sections here: "Fulfills Duality", "On The Fence", and "Does Not Fulfill Duality". Remember, this is my opinion, so take that as you will. HQ units will not be included, as they have access to every piece of wargear and are naturally dualistic if properly armed. Crusader Squads -- These guys are able to be armed for multiple roles on the battlefield. Whether you choose to use them as a close combat unit or a fire support unit, you have the tools to do so. Conventional wisdom for CC-oriented units suggests that you take a meltagun (for AT duties) and a powerfist/thunder hammer. The powerfist/thunder hammer is an insurance policy against very high toughness units such as vehicles. However, a power axes aren't a bad choice either if you're careful to avoid those high toughness, multi-wound units. Shooty units will usually find themselves at the minimum squad size with Lascannons or Grav-Cannons. The special weapon is up to debate here. If you desire a bit more AT and MEQ hunting ability, go with the Plasmagun. Or even the meltagun for its extreme AP and high possible damage. Those are only two examples of the many dualistic setups the Crusader squad can fulfill. Dreadnoughts -- Dreadnoughts are excellent in the duality. They can be outfitted with a wide variety of weaponry to fulfill a particular role on the battlefield. One of the most common is the long range Twin-Linked Lascannons and Missile Launcher Dreadnoughts. Another is the dual twin Autocannons. With either setup, the dreadnought can easily switch to a close combat role if necessary (though without Dreadnought CCWs, you'll not kill things very fast). Because most units have difficulty destroying dreadnoughts in close combat, you'll have the ability to tie up valuable enemy units for turns at a time. Venerable and Ironclad dreadnoughts are also very effective. Land Speeders -- If armed properly, these are a powerful tool in our codex. They have to ability to speed up the battlefield and then putting AT weaponry into enemy armor. Or, if the need calls for it, you can employ their anti-infantry weaponry. You can easily use their extreme mobility to contest opponent's objectives late game or block your opponent's advance. These guys can do whatever you need in the battle, for a reasonable price tag. Terminators -- Terminators fulfill duality quite well. Generally considered to be primarily close combat-oriented unit that specializes in anti-infantry roles. This is basically true, but simple wargear changes will allow you to fulfill other roles if needed. The primary way of doing this is shifting the ratio of lightning claws towards thunder hammers and storm shields. You are also able to take tactical Terminators with Cyclone Missile Launchers or Assault Cannons to provide a credible threat to all kinds of units. While doing so, they provide a deterrent as bubblewrap to any enemy wishing to get too close. Predators -- Just like everything else, their weaponry setup is everything. Any loadout on the Predator Destructor (besides being "naked") fulfills duality. The basic Autocannon and Heavy Bolter armament allows you to effectively deal with infantry, but the Autocannon can punch through light armor with reasonable success as well. Hybrid builds also do well, as they can deal with vehicles and infantry reasonably well. I prefer to use the Destructor variants in nearly all of my lists. Land Raider Crusaders -- These are on the fence because they are so expensive. While they can easily deal with infantry and vehicles with it's weaponry, they demand the highest attentions from your opponent because of the cargo they are carrying with them (likely assault terminators). If they can get safely across the battlefield, they'll do well in a duality role, but often won't get that far. Being so shiny and cool isn't always a good thing. Assault Squad -- An echo is starting to form. Their weaponry is important. Minimum sized dual Plasma Pistols and Power Fist can easily deal with Monstrous Creatures, light armor vehicles, and tie up small shooty-type units. However, they are expensive for what they do, especially when you have the Land Speeder in the same slot. They are also vulnerable to incoming enemy fire while crossing the board, though they can act as a deep strike unit. Rhinos -- The king of transports. Relatively cheap and provide excellent protection from long range weaponry with its smoke launchers. However, once the squad leaves its confines, the Rhino only provides a few things to your game plan. Mobile cover, "Rhino Blocking", assaulting "bumper-cars", and can potentially contest objectives. The downfall is that the Rhino does not provide any meaningful firepower. Razorbacks -- Takes what is good about the Rhino and adds a big gun. Unfortunately, the reduced transport size limits the army builds you can use with it. It also doesn't have the protection that the Rhino has crossing the board (smoke launchers), because you'll likely want to be firing your weapon. The Razorback is also extremely expensive. Predators -- What? Why are these listed here when I just said they DID fulfill duality? Because there is one weaponry load out that puts them here. And that setup is the Tri-Lascannon armament. The only thing it is good for is killing tanks. It doesn't even kill Monstrous Creatures all that well because it lacks the shots to do so. Expensive (though cheap compared to our SM brethren) and the AC/Las hybrid does the same job for 20 points cheaper. Vindicators -- Completely devoted to killing infantry. They can be used as AT firepower, but don't do nearly as effective a job of it due to the rules of the Demolisher Cannon. Of note is also the lack of range on the Demolisher Cannon (24"). Land Raider -- There are very few units that I would say never to take and this is one of them. They are neither a complete transport or weapon platform. The Lascannons are more for heavy infantry or vehicles, but does not have the weight of fire to be effective against more basic troops. In addition, the Heavy Bolter doesn't provide very good AI firepower on its own. If you want a transport with AV14, get a LRC. If you want a firepower platform, get predators for a fraction of the points cost.